John Ging, Head of United Nation’s Relief and Works Agency in the Gaza Strip. A global coalition of Palestinian support groups is taking protest to a dangerous new point of brinkmanship this week, with an attempt to crash through Israel’s naval blockade of the Gaza Strip in a flotilla of cargo and passenger boats now assembling in the eastern Mediterranean. Converging at an undisclosed rendezvous in international waters, the four small cargo boats and four passenger vessels – ranging from cruisers carrying 20 to a Turkish passenger ferry for 600 – are a multimillion-dollar bid to shame the international community to use ships to circumvent Israel’s tight control on humanitarian supplies reaching war-ravaged Gaza. A senior foreign ministry official described the flotilla as a ”provocation and a breach of Israeli law”. Israel already has a ”large naval force” on manoeuvre in the area; and as a confrontation at sea looms, suspicion was taking hold in both camps. Mechanical difficulties in the boat bound from Ireland – the 1200-tonne MV Rachel Corrie, named after an American who was crushed to death by an Israeli army bulldozer in Gaza in 2003 – prompted claims that the boat had been sabotaged. Unnamed Israeli officials have claimed elements in the flotilla would attempt to garner media attention by seeking to provoke Israeli violence. Further complicating a tense scenario were reports of a welcome fleet of small boats attempting to put to sea from Gaza, and of an Israeli ”counter flotilla” that had assembled near Tel Aviv as a “civil initiative … not connected to any political group”. Israel has rejected pleas by several ambassadors, most vocally by Dublin’s envoy to Tel Aviv, that their nationals on the flotilla be given safe passage to Gaza. In the port of Agios Nikolaos, here on the Greek island of Crete, one of the lead organisers of the flotilla is the Free Gaza Movement’s Renee Jaouadi – a 34-year-old schoolteacher, formerly from Newcastle, NSW. Under the banner of the Freedom Flotilla, the protest is a $US3 million-plus ($3.6 million) operation. 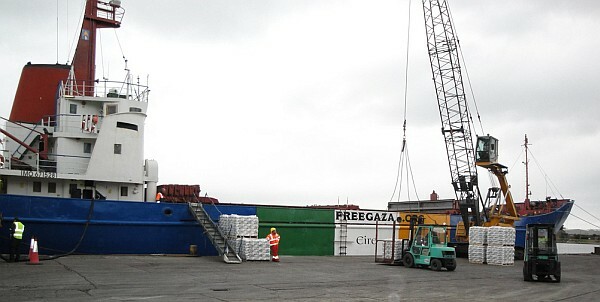 Apart from 10,000 tonnes of building, medical, educational and other supplies, on board are dozens of parliamentarians from around the world and professionals planning to offer their services in Gaza. This is deliberately their biggest operation. Ms Jaouadi said the number of vessels and passengers in this week’s flotilla was intended to overstretch the capacity of Israel’s navy and, in the event of mass arrests, the capacity of its prisons. A delegation from the California-based Free Palestine Movement includes Joe Meadors, a decorated Navy veteran and one of the survivors of the 1967 attack on the U.S.S. Liberty, in which Israeli fighter planes and ships killed 34 Americans and wounded 173, and Ambassador Edward L. Peck, who spent 32 years in the Foreign Service, including stints as Chief of Mission in Iraq and Mauritania, and was Deputy Director of the Cabinet Task Force on Terrorism in the Reagan administration. Explaining his decision to participate in the convoy, Ambassador Peck said he wants to show that many Americans oppose Israeli policy and believe that it is in U.S. interests to hold Israel to accountable to international law and human rights standards. “All the peoples of the Middle East will live in peace and security only when and if all of them live in peace and security,” he said. The State of Israel has no interest in flooding television screens all over the world with footage of its navy violently assaulting against peace activists at sea. It is time to remove the suffocating siege and allow residents of Gaza to have free contact with the outside world, freely operate sea and air ports of their own like any country in the world. The Gush Shalom movement calls upon the government to allow the eight-boat aid flotilla from all over the world to reach the shores of Gaza, where they are scheduled to arrive next week, and unload the humanitarian cargo which is urgently needed by the residents of Gaza. In a letter to Defense Minister Barak, Gush Shalom calls upon him to cancel immediately the instructions given to Israeli Navy ships off the Gaza shore to intercept the aid flotilla. “The whole world is looking. The State of Israel has no interest in flooding the international television screens with images of Israeli sailors and naval commandos violently assaulting hundreds of peace activists and humanitarian aid workers, many of them well-known in their countries. Whose interest will it serve when hours long dramatic live reports arrive from the Mediteranean, with the world’s sympathy given to hundreds of non-violent activists, on board eight boats, assaulted by the strongest military power in the Middle East?” were the words of a letter to the Defense Minister. No harm whatsoever will be caused to Israel from the aid flotilla reaching Gaza Port and unloading a cargo of medical supplies and medicines, school supplies and construction materials to rebuild the houses destroyed by the Israeli Air Force a year and half ago and not yet been restored. On the contrary, it would be in Israel’s best interest to declare without delay that as a humanitarian gesture, the boats’ way will not be blocked. And in general, it is time to end once and for all the suffocating siege imposed on the Gaza Strip and causing terrible suffering to its million and a half inhabitants. The siege on Gaza utterly failed in all the goals set for it by the government of Israel. The siege was supposed to result in toppling the Hamas government – and on the contrary strengthened this government, which relied on the support of a significant part of the Palestinian People. The siege was supposed to help in gaining the release of captured soldier Gilad Shalit – but on the contrary, the siege just delays that release, which could have been achieved long ago had the government of Israel agreed to the prisoner exchange deal, on which most of the details have been decided long ago. It’s time to end this cruel and pointless siege. The residents of the Gaza Strip, like the citizens of Israel and of any other country in the world, have the right to maintain direct contacts with the outside world – to leave their country and return to it, to develop their economy, to import the products they need and export their own produce to anyone who wants to buy it, without asking or needing for permission from Israel, Egypt or any other country. Just as Israel needs no permit from any other country to operate daily the sea ports of Ashdod and Haifa and Eilat and the Ben Gurion International Airport, so are the Palestinians and their state to be entitled to run their own sea port and airport in the Gaza Strip. Let the flotilla of humanitarian aid from all over the world be given the honour of inaugurating the sovereign Palestinian Port of Gaza! We’ve all caught the fever, every one of us who works to send boats to Gaza. From August 2006, when a handful of us started the Free Gaza Movement, every one who has joined us has been stricken with a bad case of the disease. It is chronic. It sometimes causes afflicted patients to insist that if just one more voyage can be planned to this small slice of the Mediterranean, we’ll all be in remission. There is no real cure in sight… yet. Gaza Fever has now attacked thousands of us who have a passionate sense of justice. The disease began shortly after Israel invaded Lebanon in 2006, as a group of us were in despair that the Palestinians, once again, were the forgotten symptom of Israel’s grand designs. As the world watched the defeat of Israel by a small band of guerrilla fighters in Lebanon, Israel decided it would take its wrath out on the Palestinians, specifically the Palestinians of Gaza. We watched as Israel, in January 2009, deliberately bombed 1.5 million Palestinians into abject poverty, a man-made catastrophe bordering on genocide. One man in Australia suggested we sail a boat from New York to Gaza in protest of the closures there. That small idea has grown into a flotilla that leaves at the end of May with 700 people on board nine ships. We, who have traveled by boat to Gaza, come back changed, blisters of outrage forever marking us. Those who have supported us through donations, letters, outraged picketing in front of Israeli Embassies demanding Israel stop its war crimes against a civilian population are also changed, as they watched our small boats sail into Gaza five times, cheering us on our way. Then, when our last three missions were violently stopped by Israel, thousands stepped up and donated to help us buy new boats. In July 2009, Tun Dr.Mahathir bin Mohamad, former Prime Minister of Malaysia, and his wife, Tun Dr. Siti Hasmah bin Mohamad visited the Free Gaza Movement in Cyprus. They had heard about the voyages to Gaza and what Israel had done to the last three, ramming the Dignity, turning one back under threat of fire and hijacking the Spirit of Humanity, kidnapping the 21 human rights observers and throwing them into detention for a week. When we replied that, indeed, we had crossed the sea in not only this small boat, but one even smaller, 44 of us challenging Israel’s blockade on the 1.5 million Palestinians of Gaza, he caught Gaza Fever. And that’s exactly what he and his wife did. Follow the progress of the Freedom Flotilla on Twitter and at WitnessGAZA.